The user documentation on CWE features will indicate the version of CWE used to label CWE check-boxes and other CWE indicators. AdaCore makes annual major releases of all products, and a mid-year bug-fix release. At these times we will ensure the documentation of CWE capabilities are up to date. We will also update documentation as we update individual messages to match new CWE revisions. Through GNATTracker customers receive semi-annual updates, as well as "wavefront" releases during the year when a specific bug-fix is requested. 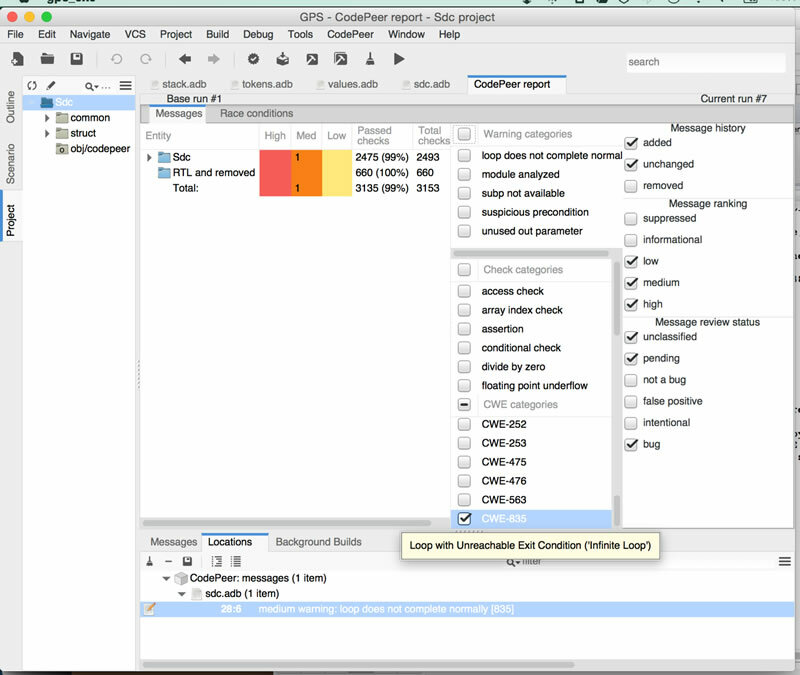 The user can select which particular CWE identifiers are of interest by using the check boxes in the CodePeer Report window in GPS. By hovering over a CWE checkbox, the CWE description becomes visible. Here we have a screen shot where only one CWE item is checked, namely CWE 835 (Loop with unreachable exit condition). We can drill down to the actual source code by clicking on the message of interest. Each message described in the CodePeer user manual (Help/CodePeer/Manual) identifies the associated CWE identifiers, if any. In addition, on the CodePeer Report messages window, all CWE identifiers associated with any messages of the current CodePeer run are included in the set of checkboxes beneath "CWE categories." As indicated above, by hovering over any one of these CWE identifiers, a longer description will be displayed. See section (A.2.1) above. 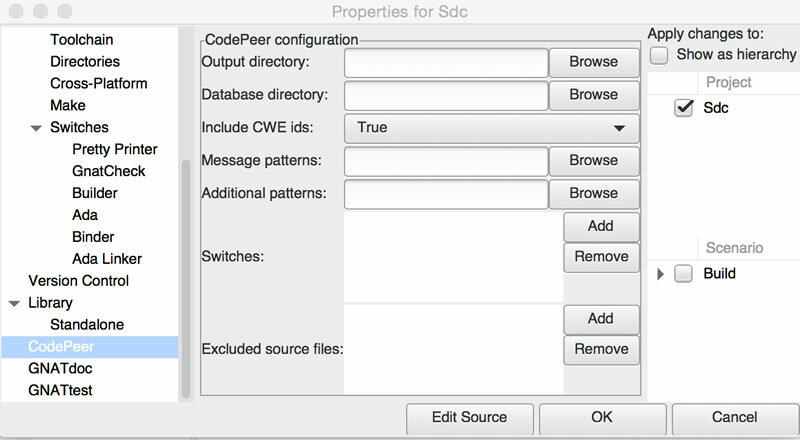 By checking or unchecking CWE identifiers of interest, CodePeer will include or exclude messages with the associated CWE identifiers. 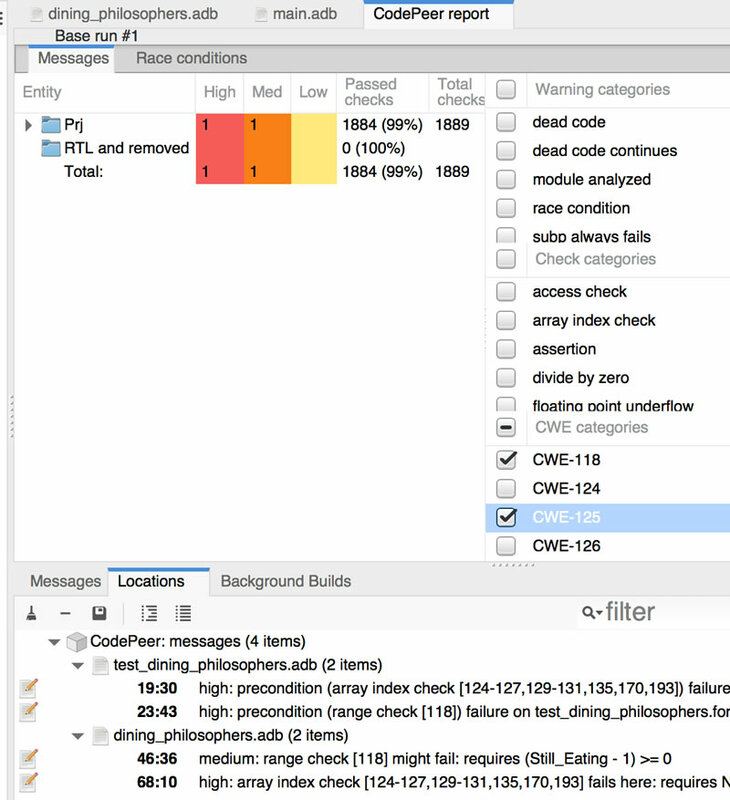 CodePeer only displays CWE identifiers that are associated with at least one message produced by the current CodePeer run. See (B.3.2) below for sample output. The CSV file can also be produced using the GUI (see item (B.4.3) below). The SATE V output format is the same as the SATE 2010 format. SATE 2008 and 2009 outputs are subsets and are therefore compliant with the latest version. Id - a simple counter, unique within the report. (Optional) id - path id. If a tool produces several paths for a weakness, id can be used to differentiate between them. (Optional) fragment - a relevant source code fragment at the location. (Optional) explanation - why the location is relevant or what variable is affected. Name (class) of the weakness, e.g., "buffer overflow". (Optional) CWE id, where applicable. Severity on the scale 1 to 5, with 1 - the highest. (Optional) probability that the problem is a true positive, from 0 to 1. (Optional) tool_specific_rank - tool specific metric - useful if a tool does not use severity and probability. If a team uses this field, it would have to separately provide definition, scale, and possible values. Output - original message from the tool about the weakness, either in plain text, HTML, or XML. The latest SATE XML schema file can be downloaded here (http://samate.nist.gov/SATE5/resources/sate5.pathcheck.xsd). The CWE identifiers are included in the <name...> tag identified by a "cweid=nnn" attribute. The XML file is produced by invoking "samate_msg_reader" on the command line. A comma-separated-values (csv) report can be generated from GPS by using the CodePeer menu, selecting "Generate CSV Report." This will produce a "codepeer.csv" file, which when opened as a spreadsheet, will have a CWE column which will identify the relevant CWE identifier(s) associated with each message. "As an authorized representative of my organization I agree that we will abide by all of the mandatory CWE Compatibility Requirements as well as all of the additional mandatory CWE Compatibility Requirements that are appropriate for our specific type of capability."